After going for so long without any days off, it feels weird as a fan of the Cincinnati Reds for them to have two off days so close together. There was no game yesterday, but the team still made some news by tweaking their starting rotation. The Reds have pushed Tony Cingrani back a day in their rotation, keeping right-hander Mat Latos on his regular rest, pitching Thursday in Miami, with the lefty Cingrani pitching Friday in Philadephia. Anything having to do with Cingrani and Leake, of course, makes the wannabe Walt Jockettys on Twitter fire up the speculation machine about what to do when Johnny Cueto successfully completes his rehab assignment. And that’s what this week’s blogger question on Red Reporter deals with. With Johnny Cueto returning from the DL soon, who gets bumped from the rotation? 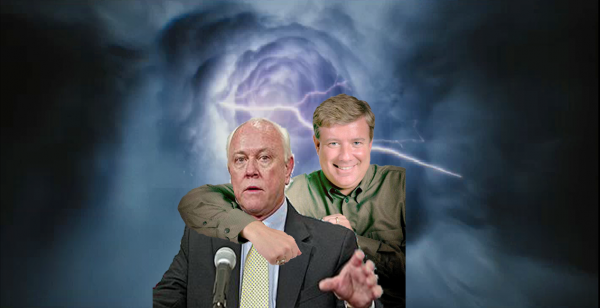 Jim Bowden from 2003 and Walt Jocketty from 2013 navigate the time vortex to make a wibbly wobbly timey wimey trade. Head over for the insight from your favorite Reds blogs. I’m partial to mine, naturally, as I feel I solve two issues in one transaction. We’ll just have to find a machine to navigate the time vortex.